Violet DeVille | February is almost here! 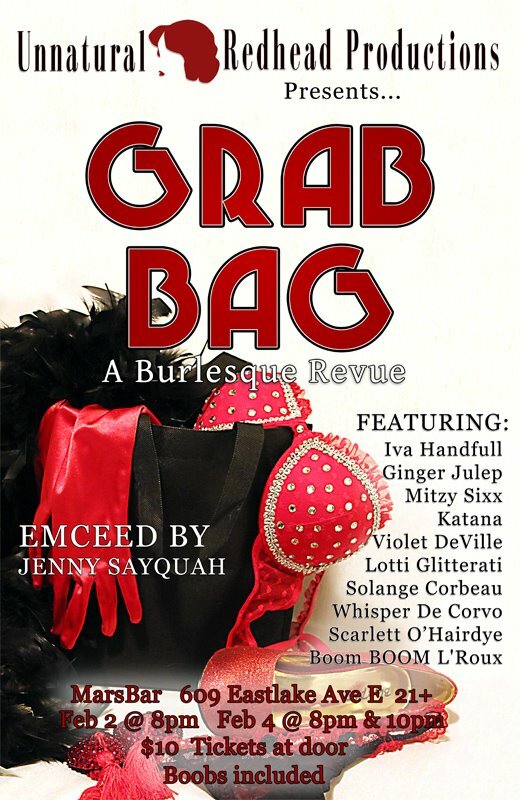 First up on the calendar is Unnatural Redhead's Grab Bag at the marsBar on Eastlake. There are three shows. The first is on Thursday, February 2nd, at 8pm in the evening. The second evening, that of the 4th, has two shows at 8pm and 10pm. Tickets are $10 at the door and that price includes boobies. How can you go wrong? What's even better is who I get to perform with! I'm talking about Iva Handfull, Mitzy Sixx, Solange Corbeau, Whisper De Corvo, Scarlett O'Hairdye, Ginger Julep, Katana Bellydance, Boom BOOM! L'roux, and Lotti Glitterati! I'm especially excited about performing with Boom BOOM! L'roux because I haven't had that oppurtunity before I love performing with new people! 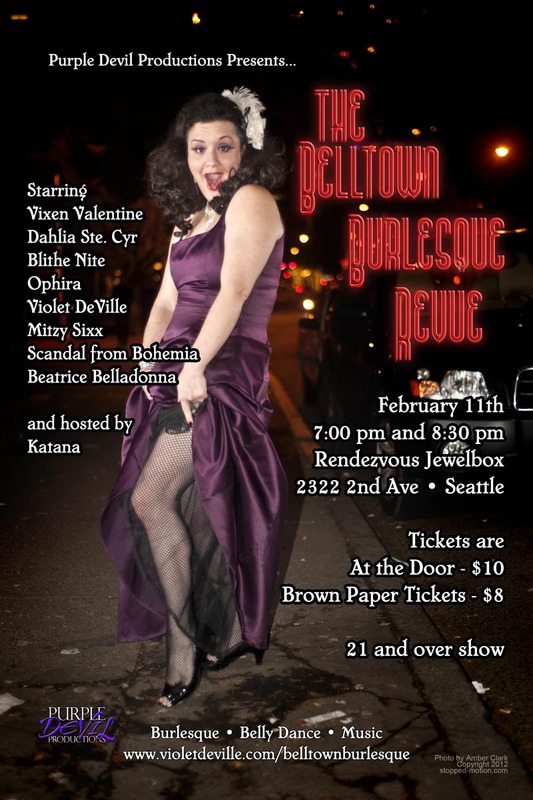 Next up is the Belltown Burlesque Revue and that's my show on February 11th at 7:00pm and 8:30pm at the Rendezvous Jewelbox Theater. Featuring the works of Vixen Valentine, Dahlia Ste. Cyr, Blithe Night, Ophira, Mitzy Sixx, Scandal from Bohemia, and Beatrice Belladonna. The lovely Miss Katana Bellydance is our hostest for the evening and tickets are just $10 at the door. On Tuesday, February 14th, the end is nigh! 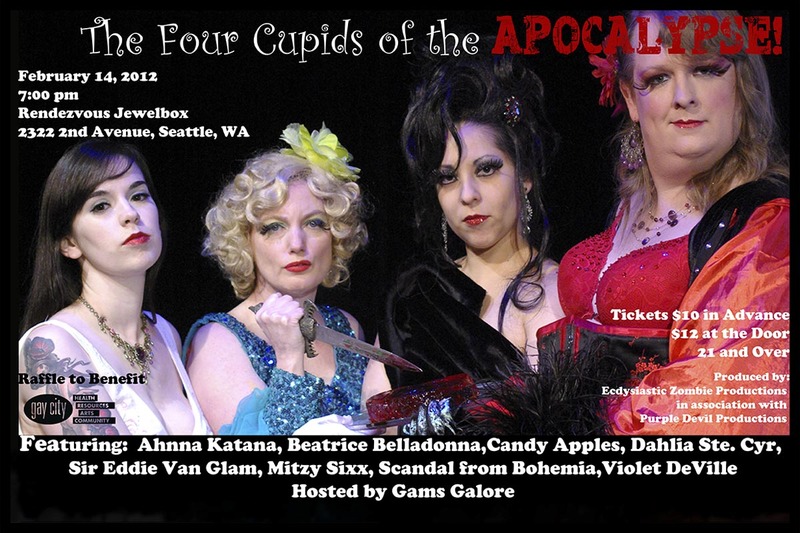 For St. Valentine's Day the Four Cupids of the Apocalypse cometh! Don't we make a cute little grouping of mischief makers? Come join us when we put the holiday out of its misery on the 14th at 7pm. The cost of the show is a paltry $12 and the raffle at intermission goes benefit Gay City. With me for this outing are Ahnna Katana, Beatrice Belladonna, Candy Apples, Dahlia Ste. Cyr, Sir Eddie Van Glam, Mitzy Sixx, and Scandal from Bohemia. Gams Galore, whom I adore like adoration is going out of style, will be our host for the evening.